Fit-Ink: Did you Run Lucky? I honestly didn't know what I was getting myself into last night when I put my usual Thursday spin routine aside to go for a run. I had an invite that told me to arrive at Niketown at 6 p.m., bring my I.D. and wear green, but that was where the details ended. While the mystery was a selling point for me--and hundreds of other runners (or so it seemed judging by the line and amount of people packed into Niketown first floor)--it wasn't enough to convince a few others to join me. I'm being a little unfair with that as I only asked three runners: one had to work late, another (hubby) wasn't feeling well and I can't argue with someone who has to go to work at 5:45 a.m., and the other had an appointment. But after it's all said and done, they missed out. If there was ever a night to celebrate running and get excited for the season ahead, last night was it. And I'm not just writing that because the weather couldn't have been better to get out and run--a night that we haven't seen since sometime in late January (I remember because that was the last time I ran outside)--or that it was Thursday and we only had one more work day to survive before the weekend, or that March typically means spring's arrival and we weren't bracing for a late-season snowstorm. But the crowd coming out to run was huge--and they were dressed in green as the invite requested. And the celebratory atmosphere, you couldn't help but want to run through the streets. I should have known better since the cold didn't keep runners inside last winter for Fleet Feet's midnight run, but it didn't click until I saw the registration/gear check line filling the front of the store and runners continuing to spill in until our 6:30ish departure time. As for how the mystery unfolded? That's going to be a story of words and some pictures. And forgive me in advance for some of the lackluster photos--I was trying to snap away as quickly as I could but sometimes my camera didn't want to cooperate or I was too close to the scene to capture it all in one shot without sacrificing something. First up comes the sea of green among the runners. You know how you make a request to wear a particular color or bring a certain item and inevitably someone forgets or doesn't play along? You really couldn't have an excuse last night, even if you really didn't have green in your closet. There were kilts, old Shamrock Shuffle tees, fleeces, green man-and woman--suits, hoodies, and that's just talking about the gear we came with. Nike was quick to provide green gear for those without or those who wanted to accessorize. We're talking shamrock scarves, green glowing glasses, "Kiss Me I'm Irish" necklaces, T-shirts, green and white striped arm warmers (or at least I think Nike provided those since several donned pairs), and even some special Run Lucky jackets and green feather boas. Step two was assembling outside the store and waiting for the green light to charge full speed ahead. We lined the sidewalk at the corner of Michigan and Huron, huddled like we would be for a race start and then it was off. And in typical race fashion, we started running only to stop a few steps later and then take off again. But unlike a race, there was no pushing or shoving to get to the front of the pack--no one cared who was first, no one cared how fast we ran (thank goodness since I could hardly move after smacking my tailbone on the slopes the week before), and no one cared about who we ran with. It was more about the allure of where we were going, where we'd make the next turn and who was going to get stopped by the "Don't Walk" signs. And what we'd encounter next on this journey, like the bagpipers lining the route, signaling that we were on the right track. I kept wondering how far we'd run west before stopping and found my answer when we wound south, west, north and west again to reach the El tracks, climb the station's stairs and wait for our Shamrock Express. Talk about special treatment: Nike commandeered a train decked out in Run Lucky regalia to transport us to the next spot. 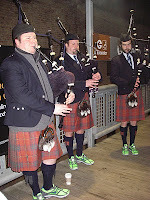 Now normally I'm not a fan of waiting for an El, but this was worth waiting for...we had commuters staring at us--mostly in disbelief--bagpipers serenading us as we waited (and check out their shoes, they're green! ), and Irish step dancers freezing their legs off on our account. Next it was full speed ahead to our final destination: Mystic Celt on Southport. That's where we needed our I.D. 's and where we were greeted with two drink vouchers and a runner's buffet complete with those snack foods craveable after a long run--wings, cheese sticks, bruschetta and veggies. Typical me to focus on the food, but that wasn't the true highlight of the night. Hanging out with other runners--many strangers for me, but for once it was OK--marveling at the green get-ups, imbibing and playing Nike trivia. Can't complain when you answer a question about Nike Air and score a skullcap and arm warmers--some peeps even went home with iPods. And capping off the evening was a concert by U2 cover band Elevation--but by the time they came on I was seated on a chartered bus back to Niketown, not entirely by choice but more because I was already committed to teaching swim lessons. Not a big deal, but knowing that I've needed running motivation all winter, Nike was feeding it to me last night and I was gladly eating it all up. And the good news for those of us in Chicago is that this fun run was only the beginning. You can't expect a special El and beer regularly, but Niketown hosts runs every Thursday from their Michigan Avenue store. Convenient for those who live in the area and the perfect stopping off point for anyone working downtown who wants to workout before heading home. Or in my case, motivational since it's hard to make up an excuse when everyone else is running, too. Now if only I could carry Thursday's momentum forward for the races coming all too quickly on the calendar.